Hello Everyone, Welcome to the Essentials by Ellen 2016 Holiday Previews. You should have come from the Amazing Sandy Allnock's Blog. But if you did not, you can start at The CLASSroom so you don't miss anything. For my first project, I used the new Stitches Cover Plate, Bird Shapes, the berry sprig image from Homespun Holiday, and peace die-cut from Holiday Words. To begin, I first distressed my card panel with Tim Holtz Distress Inks in Mowed Lawn and Peacock Feather then run the Stitches Cover Plate to give that stitched background. Then I die-cut the bird from the Bird Shapes dies four times and adhered it on top of the other. The top part of the wings were colored with Copic Markers in gray and added some Stardust Stickles to give that glittered look. I also added the berry sprig from the Homespun Holiday on the beak of the bird. For the sentiment "May your holidays be filled with wonder and touched by" is from the new Season To Sparkle stamp set, I simply cover the work "peace" with washi before inking it on the Versamark ink. Then removing the washi tape before stamping the sentiment on a gray cardstock and white heat embossed to give a white colored look. The peace die-cut is from the Holiday Words die, I also die-cut the word 4 times adhered it on top of the other and then distressed the bottom and added some Stardust Stickles for glitz. Next, I added some Pretty Pink Posh Sparkling Clear sequins to finish off this card. For this next card have a similar concept. I first distressed the card panel with Tim Holtz Distress Ink in Worn Lipstick and then added some pink dots using my Copic markers. 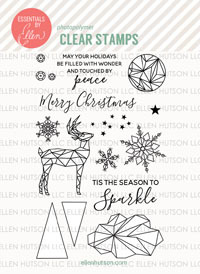 I also added some stars image from Season To Sparkle stamp set. The sentiment "Tis the season to Sparkle" is also from the same stamp set. Next, I heat white embossed the snowflakes image from the same set. 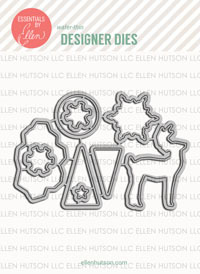 Then distressed each snowflakes and die-cut them with Season To Sparkle Designer dies. I also added some Stardust Stickles on this card as well. Next, I stamped the rock image randomly on the the white cardstock, distressed it then fussy cut. The deer was stamped colored with Copic Markers and die-cut as well. All die-cut images were adhered with foam tape for dimensions. I hope you enjoyed these products. Your next stop will be Laurel Beard's Blog. Have a great day Hopping! And, yay!!! I also get to give away an Essentials by Ellen stamp set! 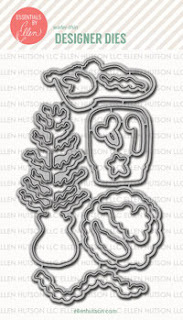 The winner may chose ANY Essentials by Ellen brand stamp set (Maximum value $25 USD) currently in stock at Ellen Hutson.com To enter my giveaway, please leave a comment on today’s post by Tuesday, October 25th! ALL winners will be announced at the CLASSroom on Friday, November 4th! Please check there on that date to see if you are a winner and for further details on claiming your prize! Your cards are gorgeous! Love that soft colors on them. Stunning cards Joni! Love the touches of glitter! Great looking cards in non traditional colours. What beautiful elegant cards! Love the dreamy colors! Your use of pastel colors make your cards look very elegant! Simple and elegant! The dove design sure lends itself to these two characteristics and you've added just the right amount of sparkle and glitz to create a gorgeous card! Love the soft colors you used on these cards. Joni, the pastel palette is perfect for showcases these lovely new images. Your cards do convey a sense of 'peace' in the most beautiful of ways! WOW on every level...Thank you! Love the new stitched background die. The bottom-only portion that was glittered on the Peace card was super special! Love both of these cards - lovely! Such beautiful cards and I love all of the color choices. Great release! Beautiful! Love the sparkle on that dove! Joni, these are so beautiful! Thank you for hopping with us and showcasing these stamps and dies so wonderfully! XO! So, so pretty!! Love the stitched background and all the sparkle on your beautiful dove card. TFS! Super COZY Stitches Cover Plate! WOW! How creative. And beautiful. WOW! HOW creative and beautiful. So soft and gorgeous, yet intricate too. Lovely. Wow, your cards are just so pretty. Love the soft colors and the sparkle. That cover plate is amazing. Both your cards are fabulous, but the second card is my favourite! They are so adorable. Love how elegant can look. Your cards are so beautiful. Your techniques on the card backgrounds are perfect! I just love your color choices, too. You have really captured the gentle look on both cards which is so peaceful as well. Peace is what we all pray for, isn't it? Both of these cards are so pretty. I love the soft colors and the backgrounds perfectly showcase the main images. Thanks for sharing your talent and inspiration! Your cards are gorgeous! I love the soft colors. I love your dove card. So elegant!! Thanks for sharing. Your cards are beautiful. I love the softness to them in the colors and image. Thank you for showing how to use that dimensional ice like stamp. Great job on that deer! Your cards are absolutely beautiful!! Love the soft colors and how you used the geometric rock as the ground. Such an awesome new release! What lovely cards!! And some great ideas for using the various elements I'd never have come up with. TFS!! Beautiful cards. I like the backgrounds and the sparkle. Beautiful cards! I love that they are a contemporary take on Holiday cards. Thank you for sharing. I had to run on over and get my new order in before they ran out , great card ! I love the peaceful feeling of your cards. Love your creations and love this release! Can't wait to get my hands on the geo tree and the background die. So many beautiful possibilities! I LOVE both of these, Joni, Season to Sparkle is one of my favorite stamp sets of the release! Oh my gosh! The pink background is amazing! I love the colors and dimensions as well as the detail on the deer! Just beautiful!! These are both so pretty! I love the soft, glittery colors and the pretty pink and whites! These colors are so soft and beautiful! These cards are so soft and beautiful. And, you used that gorgeous background die - don't you just love it? I love the soft colors you used! And your the glitter accents are awesome! Your first card is stunning! Beautiful cards! I love that coverplate! Both of your cards are so colorful! Beautiful!!! Love the soft colors and snowy backgrounds!!! Bird and stitched cover plate works really great!!!! your cards are both so beautiful! I actually gasped (with pleasure) when I saw them... lovely work, really! 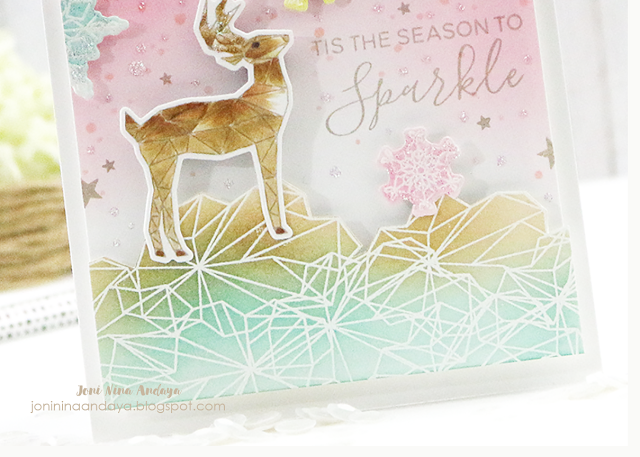 Love the pastel colors and the touches of sparkle on your festive cards. I love your pastel cards!!!! Such pretty cards! Love the sparkle and the soft colors. Always looking for winter cards to CASE . 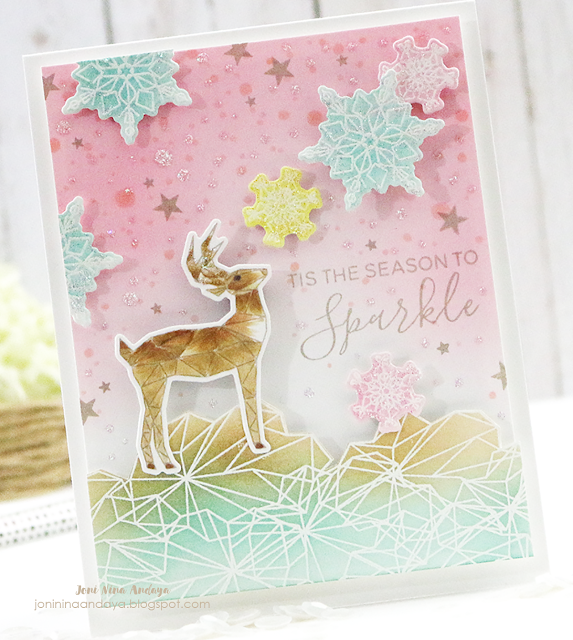 Thank you for another look at the use of the Season To Sparkle stamp and die set. Hi Joni. I love both your cards. The layout design and color palettes are perfect! Thanks for the inspiration. Wow! these are so different and yet so stunning! I would never have thought to use these color combos Thanks for the inspiration! You made two beautiful cards ! I love the stitched background of your first card; and the great colouring of your deer and the rocks of the second card ! Thank you for sharing your creations ! The soft colours and stylized Scandinavian dove join beautifully into a peaceful holiday card! Love your cards. The pastels with the deer, just beautiful. 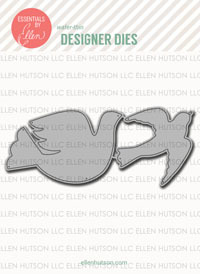 I love the peace dove card, I may have to get it! Your cards are beautiful, love all the wonderful details. I love the effect of the Stickles on PEACE. Thanks for the idea! I love how you used the cloud shape to make a ground for the reindeer. And the glitter accents are perfect! thanks for sharing. Oh my word Joni these cards are beautiful! A wonderful job on them! Beautiful!!! I especially love the dove card with the background die. Wow, what great cards. I especially like the deer on the rocks, such gorgeous color combinations. Thanks so much for sharing. So soft and gorgeous, what beautiful cards! Your cards are so beautiful. I love the backgrounds you created and the stitched die adds so much pizazz to a background. Just fantastic! These soft colors are AMAZING!!! I love these cards! And the inspiration! Oh my gosh! I just love the soft colors that you used. These cards are amazing! Joni, your cards are so so pretty. I really love your color combinations. Your cards are so beautiful, I love them both! 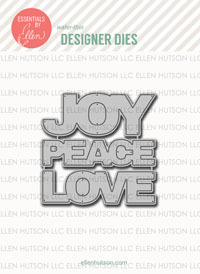 I just ordered the dove die, I think it is exquisite and I love how you paired it with the peace die cut (I may have to CASE your card). Thank you for the gorgeous inspiration! Such soft cards. I love the sparkle! Beautiful job. Thanks for the ideas and inspirations. So, so pretty! I love how you worked with so many images from this new beautiful new release. Elegant and such lovely detail! Wonderful cards, and I really appreciate your detailed instructions! Love your cards! Some great fun different sets for Christmas Cards here. Appreciate your wonderful ideas. Both cards are stunning. Love the soft colors and the beautiful use of the dies on each card. Awesome cards. Thank you for sharing your ideas. Oh, wow, love what you did with the dove die, such a perfect Christmas card. I love how you add so much sparkle to your cards. Beautiful! Love your colours with these hint of sparkles. Very lovely cards. Beautiful subtle colors and sparkle. Wonderful! TFS! Elegant, pretty and sparkly!! Your cards are beautiful. TFS!! 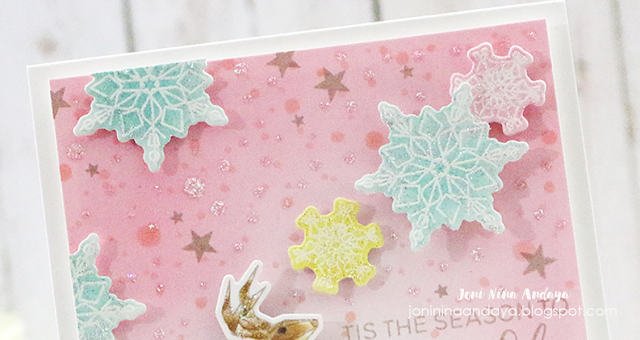 the stitches coverplate makes such a gorgeous background - lovely cards, Joni! I didn't think I'd like the dove but now that I saw your card with the colors and the sparkle and that stitched plate, I love it. Peace! Beautiful. The season to sparkle set is great too. 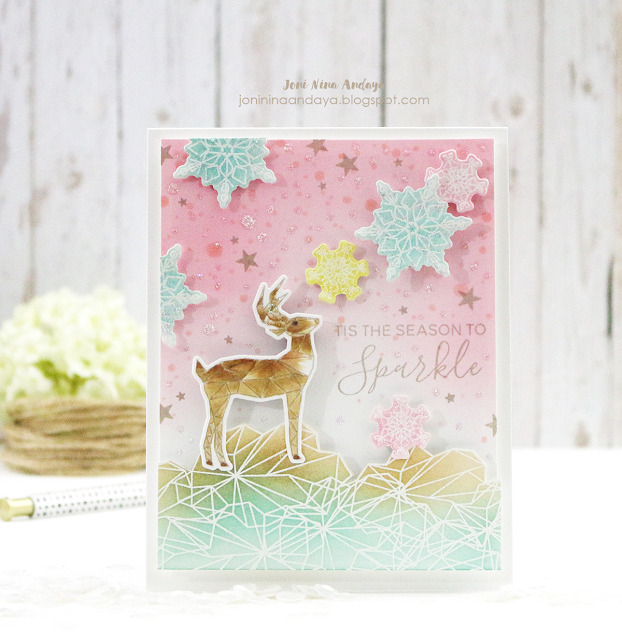 Beautiful holiday cards, love the soft colors and all the elegant details, the stitched cover plate die embossing on the color washed background, the Peace word partially sparkly and the soft colored snowflakes and deer scene. Very soft, peaceful with the pastel colors. Beautiful! Love the beautiful color palette you used! Stunning! I really like how you grounded the deer by placing him on the rocks. That stamp set is so unique! Beautiful cards! I sure like these muted non traditional Christmas colors! This release for Essentials by Ellen are awesome! Such beautiful cards ... love the geometrics! Both your cards are fantastic. The colors are great on glittered dove card. Thanks for sharing your creativity. Your cards are so beautiful. I love the stitched background and that peace dove. Love that background and your sparkles. Love your cards and the distressed backgrounds! Love your Sparkle Deer card! I love your cards -- the soft colors and the glitter. I would love to make some half as pretty! So gorgeous! Love the colors and designs. The bird card is so creative! I would never have thought to put all those different elements together. Sooo pretty. I love that stitched coverplate. Beautiful, love the pastel colors. Joni, such lovely cards,the colors are so soft & I love that deer. Than you for showing your cards. Wow....such pretty cards! Love all the sparkle! What a great release and blog hop! Thanks for sharing! Your cards your cards are simply lovely tfs. Lovely cards!! Love the pastel color and glitter!! Wow, the glitter to your cards is just stunning. Normally not a glitter girl but in the case of these cards, I might just have to jump on board. I love the watercolor effect! Love the soft colors and the mixed media look of your cards - truly unique! Great job on these cards. Lovely cards--I love the dove! These cards look amazing. Great job! Wow, beautiful cards with stunning color! Love these!! Thanks so much for sharing on the blog hop. I love the soft colors on your cards along with the glittered bird. Thanks for sharing your cards with us. Wow so pretty to see these cards. Love the first! LOVE LOVE LOVE your cards! Colours, design - they're all amazing! New fan of your blog! Wasn't sure what I thought of the cover plate but after seeing it in use, I really like it. Gorgeous cards ! Love the colors and glitters ! I love the soft ink-blended backgrounds. The colors are perfect! Beautiful cards! I love the partial distressing and adding stickles! Looks AWESOME! I always enjoy the soft colors you use Joni. These are wonderful!! I am blown away by your creativity. The colors and overall design is breathtaking. I enjoy your version of the sparkly deer. That coverplate is lovely and your second card is a delightful beauty! That stamp set and coordinating die set is really tugging at my craft strings. I like how you used a lot of elements from the stamps set to create your second card. 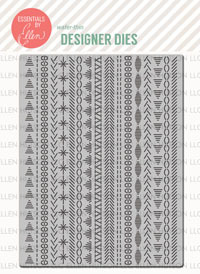 The background on the first card is eye-catching...love the cover die. I love the pastel colors, so beautiful & especially love anything with the sparkle of glitter! Love your soft colors for Christmas. Beautiful cards and I liked your take on the mosaic reindeer. Very classy. Your cards are truly beautiful. Love your color choices. So pretty, love the soft colors and sparkle! Wow! These cards are beautiful! You used sets I wasn't necessarily interested in. But, now I have to rethink it! adore you and your cards! The Dove card and colors...devine! Your cards are beautiful. Love the backgrounds. Beautiful soft cards! I love all the soft inking and colors! I really love the Peace card. It is so beautiful, thoughtful, and encouraging! Anyone would be blessed to receive it! Such beautiful colors and texture, you've really brought these stamp sets to life in you gorgeous cards!! Love that sparkling goodness. Soooo pretty! Absolutely beautiful cards! Well done! Gorgeous cards and such gorgeous colors!!! I just LOVE your cards. The colors are so beautiful and soft! What stunning work! So beautiful, the the use of the pastel colors. How whimsical is this! Love your glitter touches and choices of fabulous colors! These are so romantic!! Love the way you used the glitter on your first card! Great scene set up with the deer. Beautiful cards with nontraditional colors. I love them, pastels are so soothing and pretty. Gorgeous details on your beautiful cards! Love the colors! The cover plate and deer are two of my faves! The soft, unusual holiday colors on the deer card are stunning. Beautiful cards! Pastel colours and glitter are my favourite. You did a lovely job showcasing these new stamps and dies. Thanks for the inspiration, definitely CASE-worthy! Love love the colours on the background of your cards! Love, love, love what you did with these products!! Super creative and the colors are just amazing!! Oh wow! Your cards are amazing!!! Such beautiful cards. Love the texture that the Stitches Cover plate adds to the background in your first project. Thanks for sharing. Wow you cards are so beautiful, soft and showcases the release so brilliantly. Beautiful cards. I really like your soft colours. Love that season to sparkle set. Beautiful cards - I love the soft colours! PPP - 2016 October Product Release Blog Hop!